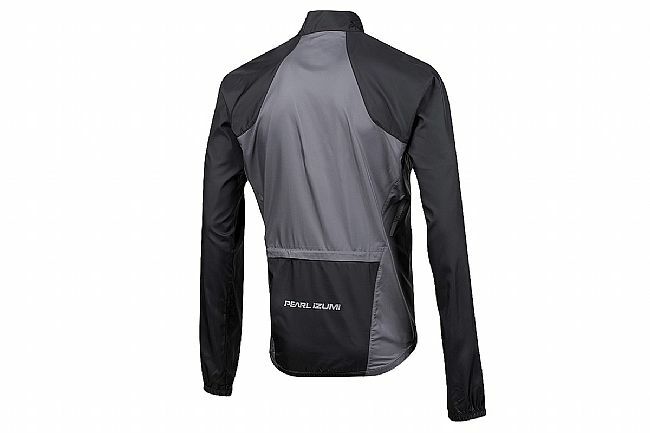 A true classic, the Pearl Izumi Elite Barrier Jacket remains the go-to option for chilly riding conditions. The core of this jacket is Elite Barrier, a material that's windproof, water resistant, and highly breathable, keeping you comfortable across a wide range of weather and riding conditions. This lightweight material also makes it easy to pack and stow the jacket when conditions improve. The Elite Barrier Jacket features a semi-form fit. Available in multiple colors. This is a great windbreaker type of jacket. It is simply a shell that is a windproof layer to get you by if you get stuck in some light rain or colder temps. 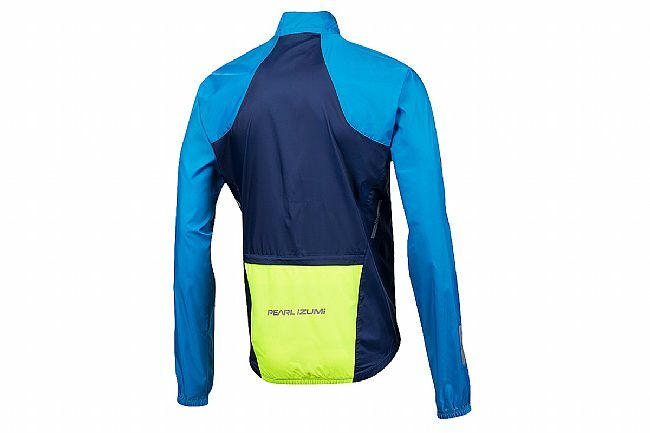 It packs down to a very small size - the one caveat is that this thing is not a normal Pearl Izumi sizing. It runs more like Castelli sizing or Assos. A normal PI Medium should be ordered as a Large - order one size up. It is ok in the chest area, but the waist area is much smaller than normal. The reason that is a big deal is because you normally have stuff in your pockets of your jersey and with this on top - it will be a tight squeeze. Go one size up and you have a winner. I have no clue why PI made this jacket with different sizing than their normal stuff, but they did. Bottom line Great lightweight and packable jacket, but order a size up. I wear this jacket over a base layer and winter jersey in 45degree to 55 degree weather. It keeps the wind out, and does not accumulate moisture. Mine is a size M and fits true to size. I wear a large Gore winter jacket, and the two fit the same. The yellow color is very bright. I want to be seen! The jacket packs down to pocket size. I paid about $60 for it and am very happy with it. Keeps the chill out, stash-able, looks and fits great! I use this on chilly mornings where a soft jacket will be too warm after the sun heats up! This is a nice lightweight jacket for cool weather. With a base layer under a jersey, you can probably go comfortably to the high 40s depending on your cold tolerance. It stows in a very small small easily fitting in a standard jersey pocket with room to spare. The lined collar is a nice feature which can be zipped up around your neck. The Screaming Yellow color is very visible and the overall construction is good quality. It has one zippered pocket on the back for storage. The only downside is the price, which is probably a little steep, but this is a well-made item. I definitely use this piece of cycling apparel more than any other that I have. Excellent wind and water protection with the added plus of being able to use it has additional layering as needed. Get the screaming yellow color as it provides great visibility on the road. Pearl Izumi makes good stuff. My cycling wardrobe is a mix of PI, Santini, Louis Garneau, and Voler, but my PI gear gets the most use. I only have one thermal jacket, and I'm glad this is it. I wore it yesterday morning (9 F, no wind, 615 AM, 16 miles) and this morning (19 F, light S winds) and remained warm from start to finish. There's not much venting, so I reserve this jacket really cold rides. It's also a bit baggy compared to my race-cut fit jerseys, so speed is reduced due to the increased wind resistance. The single rear pocket is the only feature I don't like as my phone clicks with my keys and other stuff I usually keep separate. The bright safety yellow is very visible. Overall a great cold weather jacket that works! It really is my go-to jacket for anything under 60 degrees. I use it over my short sleeve, over my thermal, and over my short sleeve and thermal (think layers). I also occasionally use it in a chilly rain as it is somewhat water resistant (you will still get wet), but this thing is NOT breathable - contrary to the description. Of course that makes sense because it could not be breathable and a barrier. Anyway, like I stated, it is a must have. Of all my clothing, this one gets used for the most situations. From looking at reviews here and on other websites, it's obvious that Pearl Izumi has dropped the quality control ball with this jacket. The one I ordered has sleeves long enough for a large jacket, with the rest of the garment too small by far to be a medium size that I received. I hope Pearl Izumi corrects this issue with newer Elite Barrier jackets.